Most people have a romantic image of the sunken treasure ship sitting upright on her keel with tattered sails still creaking in the current and brass bound chests straining with booty. Well, reality is a bit less dramatic. The classic 16th and 17th century vessels sailing to the New World laden with riches were, of course, of wooden construction. Once sunk they quickly deteriorated due to wave action and other natural elements such as destructive marine teredo worms which fed on the primary wood structure. Those who have been successful in locating and salvaging these vessels have usually spent years researching logs and voyage records to determine the wreck location. Since the wrecks themselves were long buried under sand or coral there was typically no evidence to the divers’ naked eye of a lost vessel. Tedious excavation of tons of sand, sediment, and debris was necessary before any cargo could be accessed. As diving wrecks, these older ships offered little in the way of interest unless one was a committed treasure hunter with a considerable war chest of funding. Even then your odds of success were better in the state lottery. Although some modern wooden ships are remarkably well preserved in fresh water environments such as the Great Lakes, as a general rule steel vessels have provided divers with the most intriguing wreck diving sites. These ships are better able to withstand the ravages of time and in many cases can survive over a hundred years of entombment while remaining virtually intact. A classic example is the wreck of the Royal Mail Steamer RHONE sunk in 1867 off Salt Island in the British Virgin Islands. Although her stern section sank in 15 to 45 feet of water and has been largely reduced to rubble and scattered wreckage by over 125 years of pounding surf and currents, her massive bow section (nearly 200 feet long) remains fully intact in 90 foot depths resting on her starboard side. 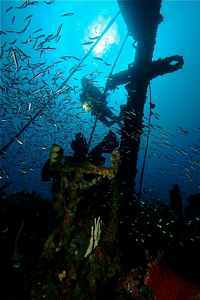 The RHONE has become the most popular wreck dive in the eastern Caribbean and much of the movie THE DEEP was shot using her remains as a natural set. The east coast of the United States has been blessed with a wide variety of wrecks that have remained accessible due to the offshore continental shelf which provides depths of less than 300 feet even thirty miles or more offshore. A proverbial grab bag of ages, types, sizes and “degrees of difficulty” are offered to divers of all levels from Key West, Florida to Eastport, Maine. Some of the best sites resulted from sinkings during the two World Wars when many a tanker, freighter, or war ship fell victim to submarine attack. Others such as the Andrea Doria came to an untimely end for other reasons. In 1956, Peter Gimble called a LIFE magazine editor to see if they would be interested in underwater photos of the ocean liner which had sunk off Nantucket Shoals following a collision with another ship only the day before. Assured that LIFE would purchase any such photos that Gimble could produce, he and Joseph Fox hired a plane and flew to Nantucket where, after considerable difficulty, they were able to charter a local boat to go out to the wreck site. The Andrea Doria was a massive ship, 700 feet in length and displacing almost 30,000 tons. She settled on her starboard side in approximately 250 feet of water. This afforded access to her port side beginning in 160 feet. Gimble used the standard of equipment of his day: double tanks and a double hose regulator with no cylinder pressure gauges. Rubber suits over woolen underwear served as thermal protection in the cool northeast water. Less than 24 hours after her fatal plunge, the ship was still gleaming white as the two divers dropped onto her port rail. Gimble began working with a housed 35mm Leica camera and had fired off only eight frames before Fox suffered dramatic incapacitation from carbon dioxide build-up. Reacting to his signal, Gimble abandoned his photography efforts and assisted his sickened buddy to the surface where he swiftly recovered. His dive had not been in vain however; the black&white Tri-X film pushed to 1000 ASA by the lab yielded usable shots and Gimble had his exclusive with LIFE. Thus was born a lifelong passion for him with the Doria. Gimble would return to the site repeatedly over the years. At the age of 52 in 1981 he mounted an expedition to recover the Bank of Rome safe from the First Class foyer. With 33 days on site, and use of both scuba and saturation divers he successfully recovered the prize. After depositing the safe for dramatic effect in the shark tank of the New York Aquarium it remained for three years. On August 16, l984 the safe was finally opened before an expectant international television audience. Much speculation had centered on the safe’s contents. Would it contain the riches in personal valuables, jewelry and gold that had fueled rumors for twenty five years? Gimble’s worst nightmare was that it might simply be empty. But as the door swung open finally, the safe revealed a mother lode of U.S. and Italian currency still neatly bundled in rubber bands. Although no gold bars were found, Gimble’s monetary haul had considerable souvenir value. The thousands of bills, each etched by the sea’s destructive influence, were marketed encased in plastic mounts with certificates of authenticity. The proceeds would not cover the 1.5 million dollar expedition cost but to Gimble the reward was adequate. He had accomplished what scores of others had attempted in vain. Today divers are not limited just to “natural” wrecks. The popularity of creating “artificial reefs” by using surplus naval vessels and ships that have outlived their commercial usefulness is increasing. Back in the fall of 1993 the city of Miami even sponsored a commercial jet airliner as one of the more innovative additions to the scores of deliberately placed wrecks off the south Florida coastline. Originally the push for artificial reef projects was fueled by fishing interests. Charter fishing captains had known for years the value of wrecks to attract and become home to resident fish populations. As divers began to visit these same sites, a symbiotic dual use was realized. Beginning in the early 1990s, wrecks that were placed beyond the 130 foot depth level have come under closer scrutiny by the growing cadre of technical wreck divers. In Key West, the massive light cruiser Wilkes Barre beckons experienced divers, her decks still bristling with heavy guns and other naval armaments. She can be dived within compressed air limits on certain sections but requires special breathing mixtures to safely explore the entire wreck. Up the coast in Pompano Beach, a series of deep wrecks all located within minutes of each other offer some of the best diving in the U.S.
1. Those divers who utilize conventional scuba equipment and limit themselves to no-decompression exposures in 130 feet of water or less. 2. Those who are earnestly venturing to deeper depths requiring planned decompression and a variety of specialized gear. This latter group falls within what came to be known as technical diving as a clarifier from traditional sport applications. Sometimes this distinction can be a bit blurry in practice since both groups are essentially diving for fun, but the technical diving group approaches many of the increased hazards of depth and longer bottom times from a decidedly more, well…technical perspective. Let’s take a closer look at some of the challenges that a diver faces as he plans deeper explorations. It’s axiomatic that the deeper wrecks are generally less visited and better preserved. But depth poses two compelling problems that must be dealt with responsibly: narcosis and oxygen toxicity. Narcosis is not much of problem for experienced divers down to 130 feet or so but, as deeper dives are made, considerations for such impairment have to be factored into the dive plan. When breathing compressed air at depth, the inert gas nitrogen tends to produce observable deficits in judgment, cognitive function, memory, reaction times etc. These effects vary widely in individual divers and can be further skewed by the influence of cold water, fatigue, and elevated carbon dioxide levels from the exertion of swimming or hard work. Some divers have found that their own susceptibility to narcosis will vary from dive to dive. Many divers also discovered that a certain adaptation to narcosis is achieved by frequent exposure to deeper depths. Nonetheless, all divers will eventually reach a point of diminishing returns while diving compressed air. For most divers the “risk acceptable” comfortable cut-off for compressed air dives will occur between about 150 and 190 feet. These are by no means magic numbers but they do serve as reasonable guidelines. As a result, the technical diver has borrowed some breathing gas technology from the Navy and commercial operations to control and limit narcosis hazards. This involves switching from standard compressed air which is 79% nitrogen and employing a trimix gas comprised of oxygen, nitrogen and helium. This mixture has several benefits. Firstly, helium has a much lower narcotic potency than nitrogen with a resulting reduction in the severity of narcosis effects at depth. Typical trimix blends will involve helium in the range of 17 to 50 per cent. This allows the diver to manage his narcosis exposure precisely even to virtually eliminating the risk. Secondly, helium is less dense than nitrogen and is therefore easier to breathe through a regulator at deeper depths. Finally, the hazards of breathing high partial pressures of oxygen can also be controlled within tolerable limits to virtually eliminate that hazard. Oxygen is not a problem within the scope of normal sport diving. But as the diver moves deeper, the partial pressure of oxygen increases until it can become extremely hazardous at depths beyond 220 feet. The most dangerous reaction to oxygen in these ranges can be convulsions which may cause the diver to lose his mouthpiece and drown. There are published guidelines for oxygen exposures available from NOAA and these represent reasonable times for different partial pressures. Their current maximum recommended dose is 1.6 ATA (atmospheres absolute) for 45 minutes on a single dive. For those of you not comfortable thinking in ATA, that is equivalent to 218 feet while breathing compressed air. By slightly reducing the oxygen content in the mixture from air’s natural percentage of 21%, a trimix diver can dive deeper without subjecting himself to elevated oxygen pressures. The advantages of trimix can be considerable but there is a trade-off in increased decompression times for typical dives of 45 minutes bottom time or less, a far stricter need to observe ascent rates and deeper decom stops, and a more equipment-intensive gear package necessitated by needing at least two gas switches during the ascent/decom phase. Trimix also costs considerably more than compressed air, and, of course, the diver will need to seek out the specialized training and supervised experience for this new technology. It can be a hefty investment but for the serious wreck diver considering diving in the plus-200 foot range, it’s a money well spent to handle the inherent physiological hazards. Other hazards must be considered when diving around wrecks. 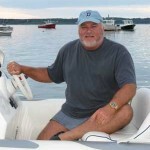 One of the most significant potential hazards is entanglement from accumulated fishing line, wire leaders and the like. Remember… fish like to live in wrecks and fishermen know that. Popular wreck sites can be become festooned with various fishing lines like a Christmas tree with tinsel. Be sure to always carry at least one sharp knife and pair of high grade wire cutters in an easily accessible spot on your upper body. The wrecks themselves can sport other equipment that can surprise a diver such as electrical wiring, conduit, and old ship’s rigging. Increasingly, the hazard of trawls and nets that snag into the wreck can present entanglement scenarios. Be aware of your environment and proceed with caution at all times. If you plan to enter the wreck to explore the interior sections you must be careful to plan for two other insidious dangers: silting and simply getting lost in what may be a very large and unfamiliar place. Fine sediments, particles, even paint chips can be stirred up and quickly render visibility to only inches. This is bothersome enough when you’re in open water conditions, but inside an enclosed compartment the loss of vision can blind a diver to the safe exit and an avenue of escape. Silting is most often caused by careless finning techniques which stir up the materials that have settled to the bottom. The alert diver is cautious to adopt a modified “cave kick” or sculling fin stroke that keeps the backwash of the kick above the floor. Experienced divers with good buoyancy control and practiced finning techniques can traverse a wreck compartment without leaving a trace of their intrusion. Some wrecks will produce silt no matter what fin stroke you employ. These have fine silt particles that cling to the overhead and compartment bulkheads. The diver’s exhaust bubbles loosen the particles and an underwater snowstorm results. This can be just as dangerous as kicking up the bottom. Never venture into an unknown compartment with first observing the area for silt hazards. A moment spent studying the effects of your kick and/or bubbles can quickly alert you to what may be an unsafe area. There are two schools of thought when it comes to dealing with wreck penetrations and the possibility of getting lost inside. In the northeast the practice of “progressive penetration” gained acceptance with a large portion of wreck enthusiasts back in the 1980s. This method required the discipline to only gradually penetrate a wreck while memorizing its landmarks, hallways, ladders, openings and other keys to getting out if contingencies were presented. This has worked well for some divers particularly those who made a practice of detailed study over ship plans and blueprints before aggressive excursions. Another approach has been to adopt the use of reels similar to those used in cave diving. This method allows for recovery from virtually any unexpected scenario since a continuous guideline to the wreck’s exterior is maintained. As wrecks get older they can be significantly affected by the sea’s natural weakening of the structure. This can lead to “break downs” both inside compartments and of standing masts, rigging and deck hardware. Pay close attention to an examination of these and other components of potential failure prior to swimming under or through such areas. Wrecks that have been sunk deliberately usually have been initially stripped of the most obvious hazards. Sometimes large access holes are also cut into the hull to allow easier access and to provide more avenues of natural light to interior areas. Extraneous equipment, wiring, and hatch covers or doors are frequently removed to prevent future problems. Be aware of what kind of wreck site you are diving as natural wrecks will not be so cosmetically attended. The imperative for proper training should stand foremost in any diver’s mind before attempting all but the most basic wreck diving. Specialty programs are available from every sport certification agency. More advanced and technical training can be obtained through instructors such as those credentialed by TDI. Their members are available internationally and offer insured curriculums in nitrox, deep air and trimix diving for wreck environments. A few headline-grabbing fatalities have occurred over the years on wrecks. But upon close examination of the accident circumstances, the great majority of such deaths have been attributable to either a lack of training or by diver errors (such as deliberately exceeding accepted oxygen limits, improper monitoring of gas supply resulting in running out of air, or becoming lost inside the wreck interior). An investment in proper training and observation of a few common sense safety guidelines will allow divers to explore the fascinating world of sunken wrecks with an acceptable degree of risk. But remember to crawl a little before you try to walk. 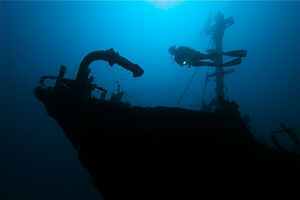 Wreck diving is one of the most exciting and challenging niches in our sport. Thousands participate in various explorations each week all over North America. Seek out a reputable dive operation or dive boat for your entry level experiences and make good use of their local knowledge and advice. You’ll be rewarded with unique marine life encounters, excellent photography opportunities, and an endless variety of “collectibles”. Tread lightly and respect the wreck, never disturb human remains, and… be careful out there!